CHICAGO, IL--(Marketwired - May 10, 2013) - Event 360, Inc. is raising the bar on obstacle course runs and mud runs with MuckFest MS. Described by Obstacle Racing Magazine as an "awesome event" for both experienced runners and experienced exercise-avoiders, MuckFest MS is a nationwide series of mud and obstacle course runs in 18 U.S. cities, bringing together friends, families, and corporate teams alike. "Early on in the Obstacle Course racing season, MuckFest MS has already set the bar high," says Boston participant and mud run blogger Rob Fournier. "Other national events should take notice. The course is beautifully designed with challenging obstacles and enthusiastic volunteers. Great Course! Great Cause!" Sponsored by Procter and Gamble's Tide® and benefiting the National MS Society, MuckFest MS is quickly becoming America's favorite mud and obstacle run with its singular focus: pure fun. Designed for people of all fitness levels as an alternative to extreme obstacle races that promise to electrocute you and set you on fire, MuckFest MS features five miles of muck-filled mazes, pits, craters, and over 20 gigantic obstacles that spin, swing and fling you up, down and sideways. "I'd heartily recommend MuckFest MS," writes Paul Jones in Obstacle Racing Magazine. "They've got a great balance between a fun course with easy to manage obstacles for the new comers and first timers -- along with challenging and technical obstacles that would give the competitive runners a moment's pause while they figure it out and navigate through. The distance was great and the venue provided some really nice trails. The festival was well run and the event organizers worked well with the biggest team and fundraisers." Did you know most mud runs and obstacle course events return a shockingly tiny fraction of funds to their charity partners? MuckFest MS returns 100% of the fundraising revenue back to the National MS Society. Upcoming events include Atlanta, GA (October 12), Baltimore/DC/Mid-Atlantic (June 29), Cincinnati (July 27), Denver (September 21), Detroit (July 20), Indianapolis (August 24), Kansas City (July 13), Milwaukee (September 14), NYC/New Jersey (June 15), Philadelphia (June 8-9), Phoenix (November 23), Pittsburgh (May 25), San Diego (December 7), San Francisco/Bay Area (October 26), and Twin Cities (August 10). Outside magazine estimates that 1.5 million people will join in on the obstacle racing craze this year. 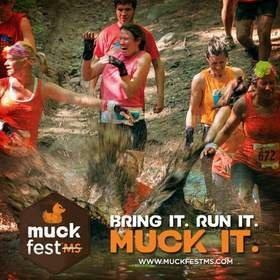 To find out how MuckFest MS is putting the fun in America's fastest growing sport, visit www.MuckFestMS.com. Event 360 was founded in 2002 to help organizations use events to create a better world. The goal is to raise $1 billion for charity by 2015. Learn more at www.event360.com. MuckFest™ MS, produced by Event 360, is the nation's best mud and obstacle fun-run. Made with mud, sweat and cheers, the five-mile course features a gauntlet of muck-filled mazes, pits and craters with over twenty gigantic steel obstacles. And here's the best part: 100% of fundraising dollars go to the National Multiple Sclerosis Society -- helping to prove that you can have loads of dirty fun and feel good about it in the morning. Visit www.MuckFestMS.com to muck things up.